I’ve been having technicolour dreams of late. Really clear dreams that seem totally realistic, without the surreal quality that dreams so often have. Bright dreams full of piercing sunshine and fast-paced narrative. When I wake up in the middle of the night it takes me a good minute or two to readjust to this reality and work out where I am and what I am doing. By the morning though I’ve forgotten most of the dreams. All that stays with me is a snippet or two, a snapshot image. I’m not sure what is causing the strange dreaming. Perhaps it is the hot sultry nights we’ve been having – heat always messes with my sleeping and dreaming patterns. It could also be the fact that I am in the advanced stages of pregnancy. Full of hormones, and baby. Either way I find the dreaming both unsettling and exciting. I’ve always loved dreaming. When I was a teenager I used to write down my dreams every morning as a way to train myself to remember them better. When I do wake up though, from my technicolour dreams, it has been taking we a while to get comfortable again and drift off to sleep. So, of all the things, I’ve found myself thinking about different dishes and foods I can cook the next day for lunch or dinner. Which is how this particular recipe came along. 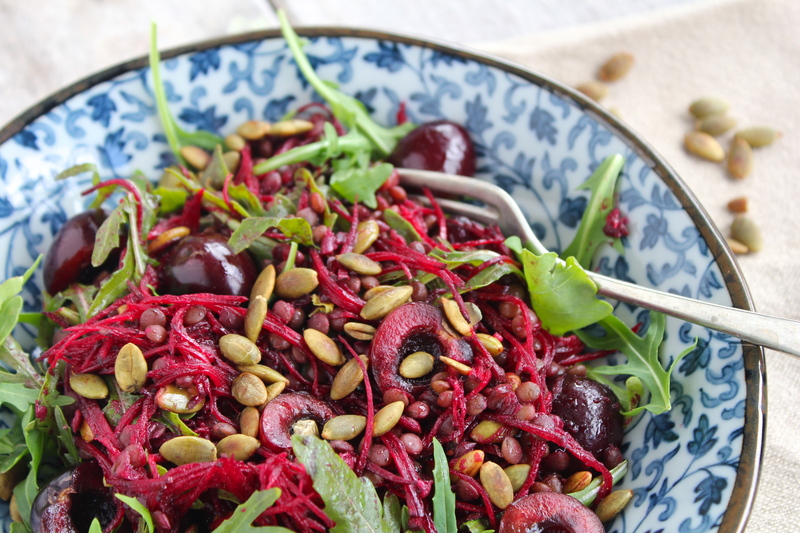 I’ve been wanting to use cherries in a savoury dish, and in the middle of the night during the week I realised that beetroot and cherry would be a perfect match. 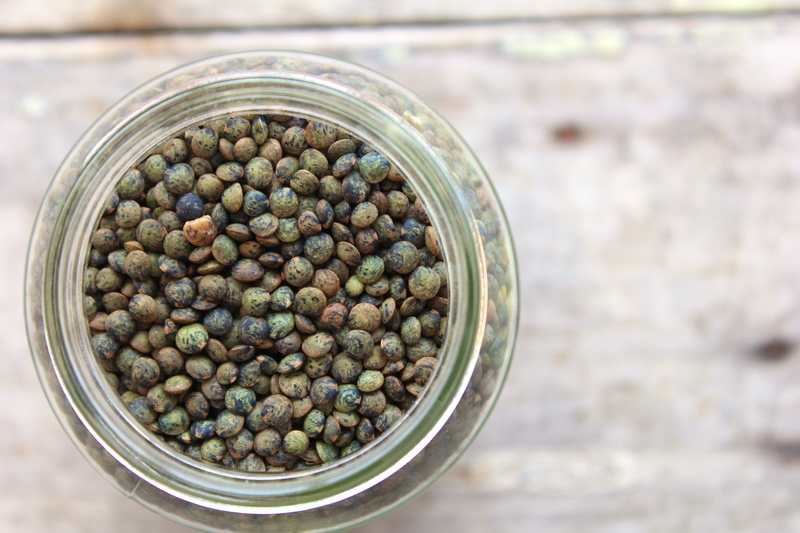 Add some lentils to make it a complete meal all on its own, a few greens, and a nice light dressing. 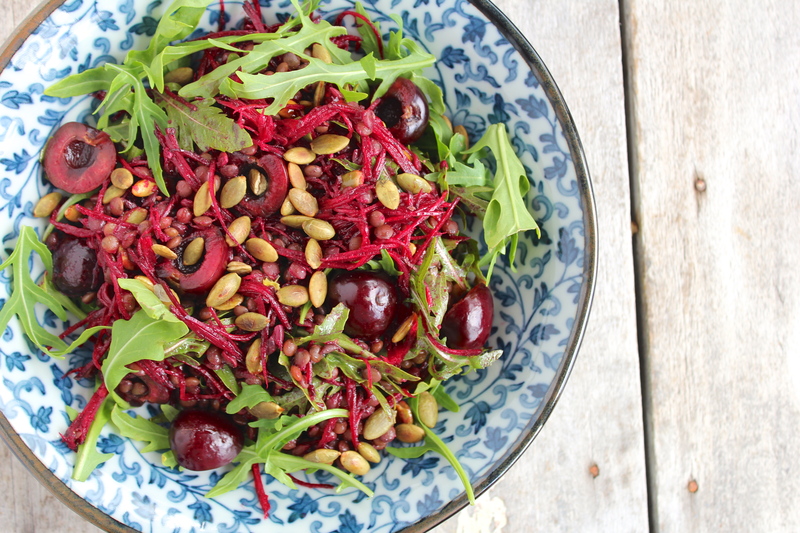 And so this Beetroot, Lentil & Cherry Salad was born. Though it seems most people prepare their holiday menu well in advance, if you’re still looking for a nice bright salad for the table I think this one would be a great option. It’s hearty and colourful, and also fantastic if you have any vegetarians coming for lunch/dinner. If you’re not vegan (or pregnant) I’d highly recommend crumbling some feta cheese on top of this salad before serving, or a generous scoop of labneh. It is yummy without, but even better with. Happy Hannukah and Merry Christmas to all! Whether it be a feast of epic proportions or some champagne and fast food, may you be celebrating with the ones you love. 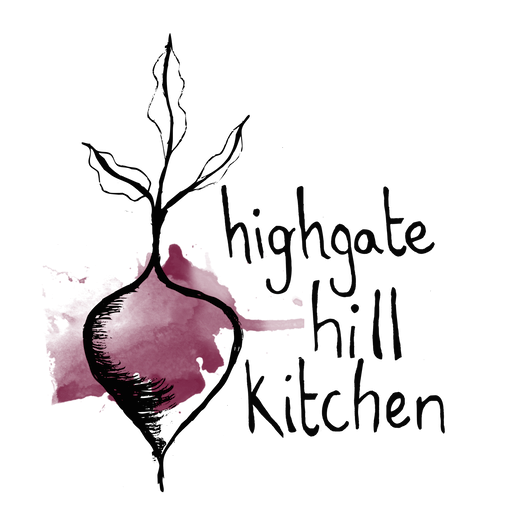 Finely grate the beetroot, either using a mandoline or box grater. Prepare the dressing by whisking together the oil, vinegar, lemon juice, maple syrup, salt & pepper. 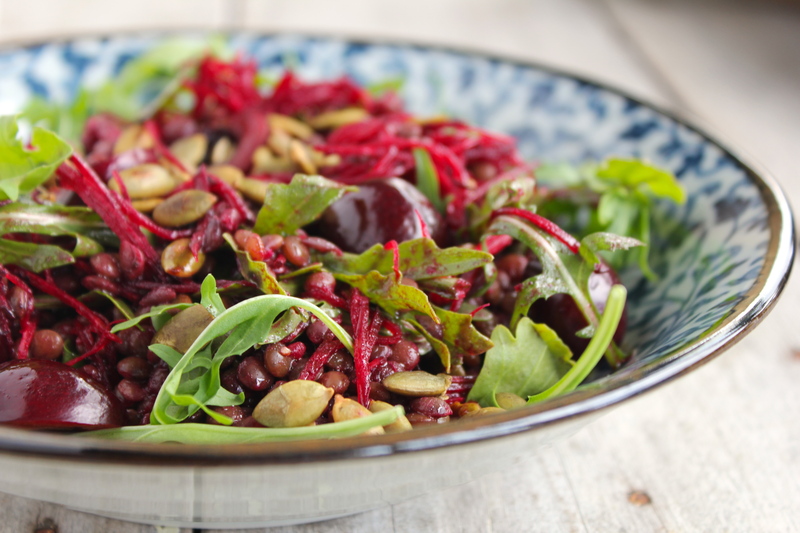 In a large bowl combine the beetroot, lentils and the dressing and mix to thoroughly combine. Set aside. Dry toast the pepitas in a pan over medium-high heat until they start to brown and pop, about five minutes (stirring frequently). 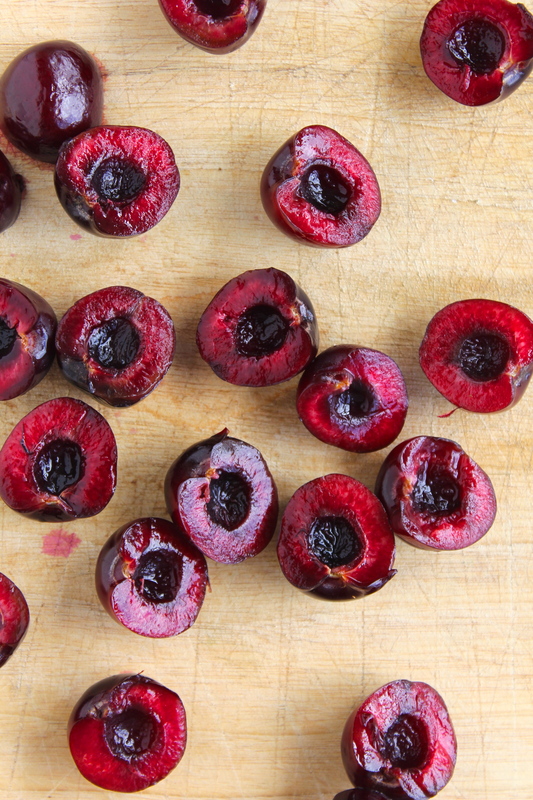 Halve and pit the cherries. 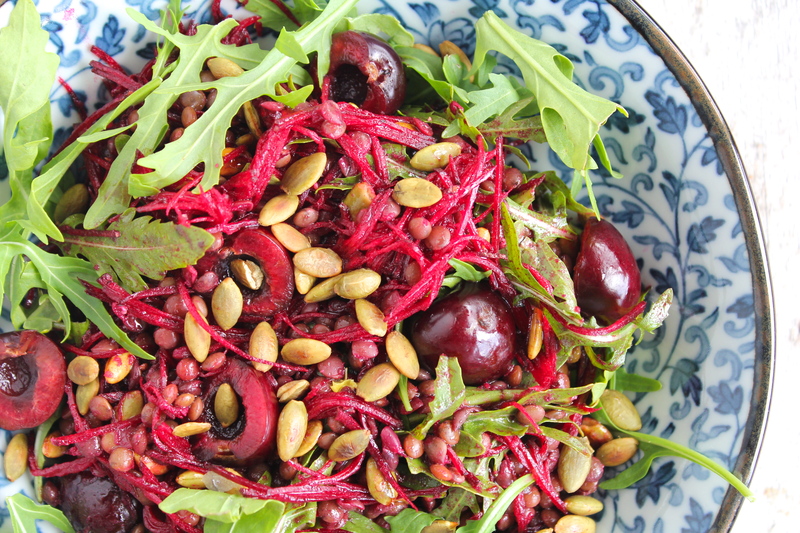 Add the cherries, pepitas and rocket leaves to the lentils and beetroot, mix to combine, and serve. Notes: this salad will hold up well in the fridge for two-three days. Also feel free to mix up the greens you add – I used rocket but baby spinach or any other micro greens would work just as well. You honestly make the best grain salads. 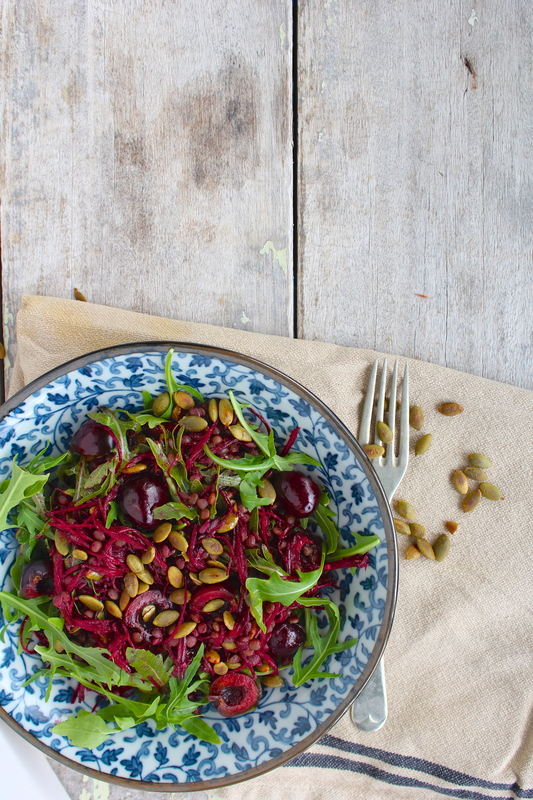 I think beetroot and cherries is a fantastic combination and I may sub dried cherries for fresh since it’s not cherry season right now and I don’t think I’ll be able to wait until summer to make this. Happy holidays to you Sarah! Thanks Katie! I think this would be great with dried cherries, or even dried cranberries. Hope you have a lovely holiday break. This was delicious. I used dried cherries, but you’re right cranberries would have done the trick too.